Looking for a cheap, easy to use therapy material? How about paper bags? I love using paper bags for a variety of activities. Here are some simple ways I have incorporated paper bags into my therapy sessions. 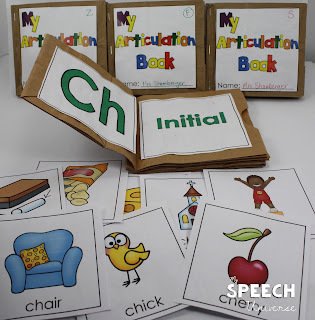 My students love to use puppets to "eat" their articulation cards or other target cards. They also love to use them to tell stories. 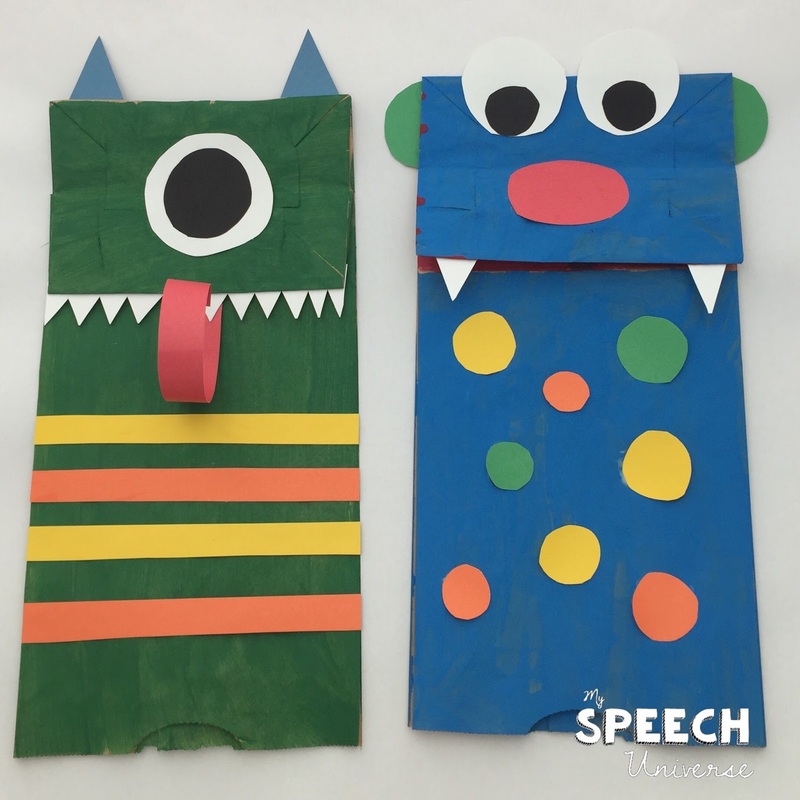 Making puppets from paper bags is a great, inexpensive way to engage your students in a variety of activities! You can easily make a puppet to match any book or story that you are using. Be creative- your kids will love it! 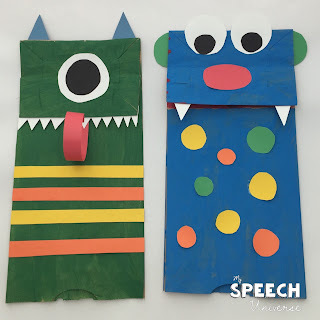 I made these monster puppets with my son this week. They were so easy to make! We used a little paint, glue, and card stock with our paper bags. This activity is also super easy. I throw a bunch of items into a bag. My students reach in and grab something (no peeking!) to describe. The students remove the object and then describe it using a variety of descriptors. This is a great way to incorporate your Expanding Expression Tool (EET) with describing real objects. Sometimes I will even get really small, cheap objects that the students can keep if they give me a description using all of the beads on the EET. 3. What is in the bag? This is a great activity to work on a student's deductive reasoning skills. I put an object into the bag (students do not see- again, no peeking). Students need to ask questions about my object. This is similar to the game Headbanz. Place pictures of categories on the bag and collect items or pictures to place in each category. I used pictures from my Category Sorting activity. I like to put a piece of Velcro on each bag so that I can interchange the categories without having to get a new bag each time. Put any kind of card into the bag. My students love to decorate a bag and then collect their cards. You can use two paper bags to make a book that will have two pockets. Simply fold two bags in half and then put the two openings touching each other to make two pockets for a book. Staple together, and done! You have a paper bag book that you can use to target a variety of goals. I used this one to put some of my new sequencing cards in for a student to take home. I have also made these Articulation Paper Bag Books. These are so fun to make with students and send home! Here is a link to a freebie that contains blank frames to use on your paper bags, as well as labels for What is in the bag? and Describe It To Me. 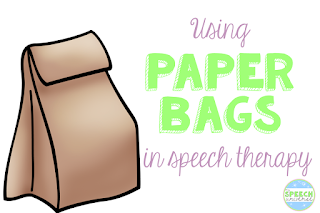 Have fun using your paper bags! I have used a similar technique to your category sorting to help students learn pronouns. I use three bags--one with a picture of a girl, one with a boy, and one with a family or group of people. I hold up a picture of a dog and say "This is her dog." The student then has to decide which bag it goes into. Continue with a variety of pictures. You can even have multiple of the same picture--one time it is her dog, the next it is their dog. Thanks for telling the ways how can we use paper bags. The detail is beneficial for me. If you want to buy recycled brown paper bags then visit Paypa.